One of the very first product reviews I did for this eczema blog was for Vaseline intensive rescue moisture locking body lotion. I wrote it from memory as this was what I used to use every day as my general moisturiser, as I always had dry skin even before my big eczema flare up. I always said I'd go back to it and try it as cream for my eczema. I stopped using it when my eczema got bad because, being what I considered an every day moisturiser I thought I needed something formulated specifically for eczema, hence my trials and tribulations with aqueous cream, Dermol cream, Balneum cream and God knows what else. I stayed over at my mum's not so long ago and I'd left a bottle of the Vaseline intensive rescue moisture locking body lotion there so I gave it a go - all over my body, eczema and all. And it was great! It's quite runny as it's a lotion not a cream so it's really easy to put on. But the amazing thing was - it didn't sting or inflame my eczema more; maybe the tiniest of prickles but not enough to make me even think about scratching. I was so relieved to find something I could use to get some moisture into my poor dry skin! The Diprobase ointment worked but it was so greasy and horrible to use. Because it's so thick it's actually really hard work to rub in - especially when you've got to cover your whole body! The Arbonne Baby Care body lotion was much nicer to use and smelled lovely but it was very expensive given how much I needed to use, and after I'd been using it for a while my skin seemed to react more badly to it. 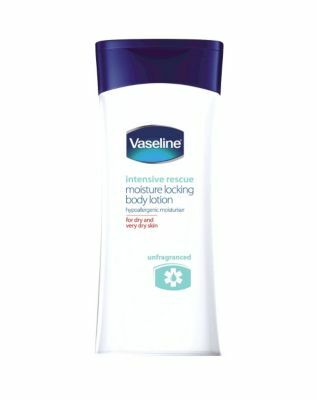 Vaseline intensive rescue moisture locking body lotion costs about £4-£5 for a big 400ml bottle - make sure you get the unfragranced version.